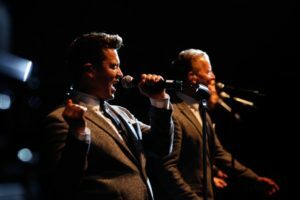 This retrospective review looks back on the Midtown Men (above)’s performance last month at the Ordway Center for the Performing Arts. I attended The Midtown Men at the Ordway Concert Hall the same week I saw Jersey Boys for the first time. When I arrived at the concert it, seemed to be Jersey Boys Redux. The foursome shined on many songs, but at times they selected the wrong songs to sing. 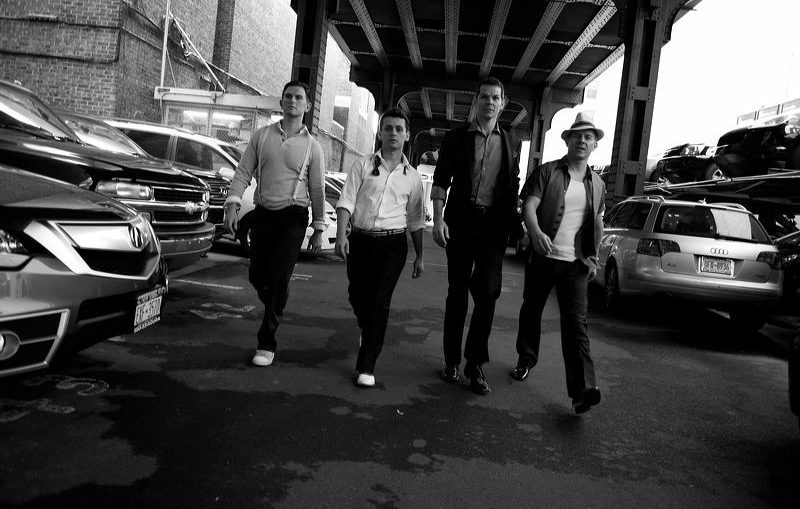 The Midtown Men is a vocal group comprised of four members from the debut season of the Tony award-winning Jersey Boys. The group consists of Christian Hoff, Michael Longoria, Daniel Reichard, and J. Robert Spenser. Hoff won an individual Tony for his role in Jersey Boys. The group’s connection to Jersey Boys was repeatedly referred to during the concert and over half of their tunes were hit songs by Frankie Valli and the Four Seasons. Needless to say, the Midtown Men did a top notch performances of the Four Seasons material, especially on the melody of Four Seasons songs. The group had more mixed results with the materials of other groups from the 1960s. The Midtown Men in concert. The group’s best performances of other artists included the Beatles’ song “Got to Get You into My Life” and a surprisingly good version of the Zombies’ “Time of the Season.” Hoff’s incredible jazzy rendition of Buffalo Springfield’s protest song “For What Its’ Worth” was the concert’s highlight. But Hoff’s version of the Monkees’ “I’m Not Your Steppingstone” was a disappointment, as was the annoying continuous projection of an old Monkees television episode in the background. Many of today’s touring groups should give the distracting video projections a rest and concentrate on more compelling songs and lighting. The group also failed to perform the music of several 1960s songs that would have nicely complement the group’s style. A lot of different music was created in the 1960s; some of the better known choral groups of the time included the Association, the Drifters, the Sandpipers, the Mamas and the Papas, and even the Lettermen had hit songs that would have nicely complemented the Midtown Men voices. The Midtown Men is a definitely must see for Four Seasons fans. But those looking for a varied musical revue of the 1960s songs will be disappointed in the group’s selection and performance of other songs.